Burberry Spring/Summer 2013 Siren Red Makeup Collection (available here) - Powerful and feminine, a siren red lip is the focus, complemented by understated eyes and natural, glowing skin. The look is elegant and effortlessly seductive. Inspired by the joyful colour explosion of the Burberry Prorsum runway, the new collection features glowing shades and effortless textures. Included in this collection are 4 new shades of lipgloss - Mallow Pink, Sweet Pea, Coral, and Fondant Pink - 2 new blushes - Hydrangea Pink and Coral Pink - and a pale gold eyeshadow. The two lip velvets Bright Poppy and Military Red are already part of the Burberry makeup lineup. The collection is currently available at Nordstrom online and should also be available in stores. My local Nordstrom had just a few pieces and testers only for the lipglosses. I picked up 2 of the blushes - Hydrangea Pink No. 10 and Coral Pink No. 9. These are my first Burberry blushes, and they do seem really nice. Here's a look at some quick swatches and photos from this collection (pic heavy post). The colors on these blushes were a bit difficult for me to photograph. Depending on the light, the colors leaned more pink or coral. In the warmer evening light, the blushes seemed to look more coral-based pink. 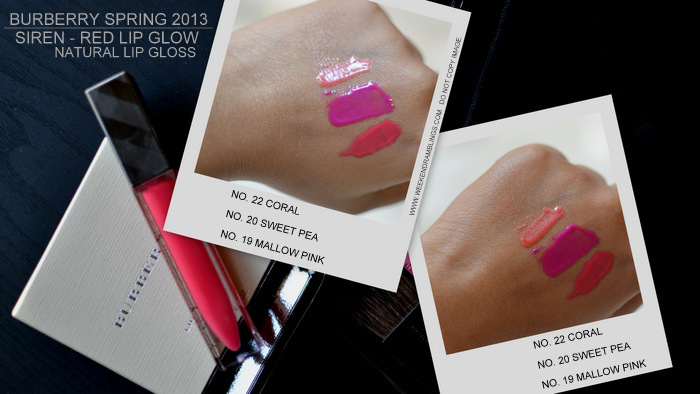 Among the 4 lipglosses released with this collection, I bought only Mallow Pink No. 19. Sweet Pea, a bright fuchsia, and Coral, a shimmering orange-coral, didn't look like they would work for my skin tone. Fondant Pink was missing at the counter - no testers either. In fact, the SA was quite emphatic that "there is no fourth lipgloss" in this collection :P Anyway, here's a look at the swatches of the lipglosses. I have added MAC Crosswires and Chanel Rouge Allure Intense lipsticks for comparisons - the lipgloss looks lovely layered over Crosswires. The swatches aren't that great, but I figured this could give an idea about the color. Two lip velvets - the Burberry version of matte lipsticks - feature in this collection, but these were released a while back and aren't new: Military Red No. 310 and Bright Poppy No. 311. Here's a look at the swatches. 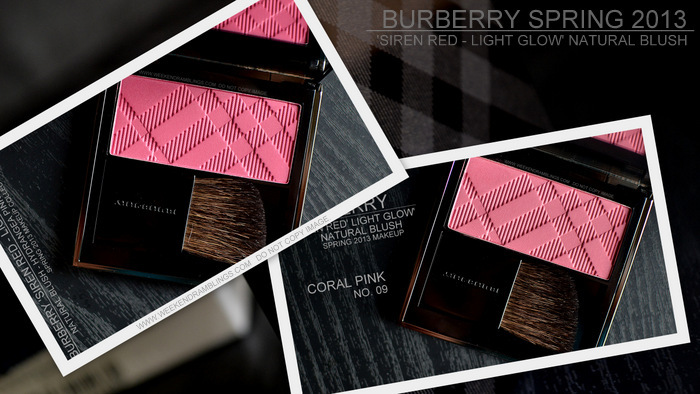 A small collection with some lovely colors and fabulous quality, among the new makeup launches for spring Burberry's Siren Red Makeup Collection would have to be my favorite. Despite not being scary dark, the blushes do seem to show up on my skin quite well (I haven't yet used them beyond swatching, though), and the lipgloss feels quite comfortable on my lips. The swatches and photos on the Nordstrom website are quite accurate, but do give this a try if you are anywhere near a Burberry counter! Loving d blushes n gloss.. Drool..
Pic heavy Post .... r u kidding me radsssss ????????????? by any means are you planning a giveaway ?? or may be you know sending it across to one of your loyal readers ? :D :D well I didn't know which photo to take out and it seemed little crowded! And thank you! Awww...you get these na, am sure you will LOVE it. A lovely melange of colors Radhika...Hope u got my first comment! Hii Neeraj! :D Am so glad this helped you..aren't the colors just amazing - you must defintely give Burberry a try! Thanks a lot Radhika...gud u got the msg..LOL..
where do u buy Burberry Beauty from? They r going to come to India someday dunno when. Are their blushers too sheer? I buy it from Nordstrom - these were from the store, but it's easier to buy online. The are also available at Saks online (no idea about in-store, don't have one nearby). Sheer? No..quite the contrary..they are insanely pigmented. I just tried out the Hydrangea Pink and I have to apply it very, very lightly with a Yachiyo!!!! However, they do not have darker colors, so ultimately the color would look very subtle only because that's what the color is like. I am quite dark, and it shows up on me without looking ashy. I am sure you won't have a problem, but I think it's quite easy to go overboard with these and go clown face because people tend to think lighter colors need to be piled on. With these blushes, the effect is supposed to be a hint of color and a natural glow - or at least, so I feel - and not really the splash of color look. So excess does tend to look too bad. Isn't that wonderful to have someone feature your blog! I adore your swatches and I especially want those lipglosses! Is there a way to follow your Blog, I didn't see a follow tag are you on Bloglovin?